When undertaking a major project such as Kitchen remodeling in Duarte CA, it’s really important to have the right contractor on the job. At Cabinet Magic, we believe we are that right contractor. With Cabinet Magic on the job, you can rest assured every aspect of your project will be handled to the very highest standard. This includes not only the typical contractor work of construction and installation, but also help finalizing your design and finding the right products and materials. 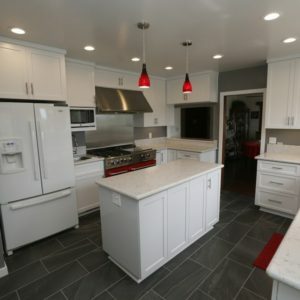 Whenever you do kitchen remodeling in Duarte CA, you run into the challenge of making design decisions based off of product samples rather than the real thing. This can be problematic. After all, samples can look quite different in your hand than installed in your kitchen. With Cabinet Magic as your contractor, you’ll never get left in suspense regarding how your kitchen remodeling in Duarte CA will turn out. We know you want to feel confident of what you’re getting before you entrust us with the project. That’s why we utilize 3D computer rendering to help clients design their new kitchens. By giving clients a “preview” of the finished job, we offer an opportunity to make any necessary design changes before work begins. Custom cabinetry can take your kitchen remodel to a whole new level. You’ll be able to maximize your storage space while also incorporating the features you want and the style you need to integrate seamlessly with your overall interior design. After nearly 30 years in the business, our skilled craftsmen have truly mastered the art of custom cabinetry. We can match any architectural style and also include all kinds of functional accessories from lazy susans to pull-out trash bins to appliance drawers and more. We take pride in our exceptional craftsmanship and we are confident our cabinets will last for decades. If you are interested in working with Cabinet Magic for your kitchen remodeling in Duarte CA, please give us a call at 800-828-4380 so we can set up a free in home consultation with one of our knowledgeable team members. You’ll have an opportunity to bounce design ideas off of us and then receive a free estimate for your remodel. Cabinet Magic is a full service kitchen and bath remodeling contractor specializing in creating beautiful, functional custom cabinetry from scratch right here in La Habra CA.